Ibrahimovic joined on a free transfer. ZLATAN IBRAHIMOVIC AND the Los Angeles Galaxy have confirmed the Swedish star’s move to Major League Soccer, having earlier announced the deal in a Los Angeles Times advert. “Dear Los Angeles, you’re welcome,” the enigmatically worded full-page advert read, above Ibrahimovic’s signature and a Los Angeles Galaxy logo. A photo of Ibrahimovic wearing a Los Angeles Galaxy appeared above a separate story on the front page of the Times’ sports section. The 36-year-old’s move to MLS had been widely reported on Thursday after Premier League giants Manchester United confirmed the player had been released from his contract. The club confirmed its acquisition on Friday afternoon, tweeting a photo of the striker in the club’s colours. “The LA Galaxy announced today that forward Zlatan Ibrahimović has joined the club,” they said in a statement. “The Swedish striker joins the five-time MLS Cup champions after a decorated career internationally and throughout Europe, where he has starred for Ajax Amsterdam, Juventus, Inter Milan, Barcelona, AC Milan, Paris Saint-Germain, Manchester United and his native Sweden while accumulating over 450 goals for club and country. 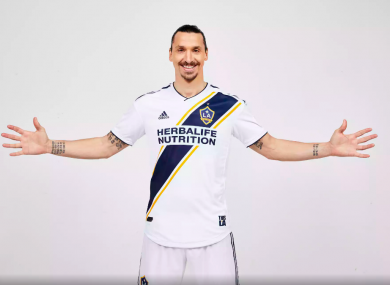 “Signing Zlatan is a testament to the LA Galaxy brand and our incomparable success in MLS since 1996,” said LA Galaxy President Chris Klein. Ibrahimovic’s transfer comes after a serious knee injury last year disrupted the end of his stint with Manchester United, who he joined in 2016 from Paris Saint-Germain. The charismatic goalscorer had not played for United this season since featuring in a 2-2 draw against Burnley on 26 December. He scored 28 goals in 46 appearances during a remarkable first season in the Premier League before tearing knee ligaments in a Europa League game last April. Email “'Dear Los Angeles, you're welcome' - Zlatan announces Galaxy move with newspaper advert”. Feedback on “'Dear Los Angeles, you're welcome' - Zlatan announces Galaxy move with newspaper advert”.